Mmmmm Cashews...now, every time u say cashew MOST people think of the nut, then again most people don't know the cashew is a fruit and well let's just say it's interesting. The greyish, blackish, green color Kidney Bean looking Seed on the top is actually what produces the cashew nut. But wait, don't just grab this thing and eat it now, it's actually very poisonous and actually needs to be roasted whole outside in the open because while roasting in a big bathe pan (is what traditionally they roast cashews in) the smoke can also cause severe damage to your lungs. You see it is actually a carcinogen...(its bad). But, once roasted the nut is shelled and let me tell you it's delicious and the fruit too (we call it the apple). Now, there's the nut that almost everyone in the world knows, but then there's the fruit...what does it taste like? What is the texture? What the hell do you do with it? OK first question, Cashew is bitter & tart and sweet and really juicy ( the juice staines clothes and doesn't come out beware!). Texture? Stringy, but not too stringy, really juicy, and soft kinda like a soft pineapple...NOW, for the fun part...what do you do with the fruit other than stick it in the fridge for it to get cold on a hot day then eat the sucker! OK, so now we know a couple things about the fruit so I decided I'm going to make Cashew Juice. Reason? Well I've never seen anyone make a juice from this juice little fruit, and I was curious. So that being said I hope you're curious as well. 1. Take seeds off the top of cashews (poisonous and raw, remember). 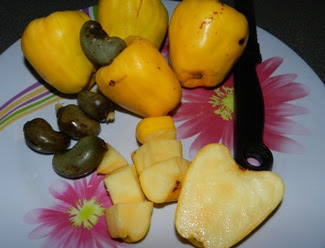 Cut up Cashew Apples in quarters and place in Blender, then blend until liquid. 2. Place strainer over bowl and pour blended liquid into strainer and mash down with the back of a spoon until only cashew pulp remains. Place pulp in a seperate container. Do this twice. 3. Pour the liquid into a gallon container (should be about 1/4 of the gallon full). Add water until it's filled and add sugar to taste. 4. You can add sprite for an extra little fizz in it, but also try half cashew juice and half Beer...AMAZING! 2. Get 2 loaf pans (small) grease the sides and bottom and then pour in the Mix. 3. You should have 2 cups of pulp; so take a little bit of pulp and just sprinkle on top of cake and bake at 325 F for as long as the box tells you to cook the pound cake. 1. In a sauce pan on low, heat melted butter with the cashew pulp. Let it simmer in butter for about 30 seconds then add Ginger and a sprinkle of cinnamon and simmer for another 30 mins. 2. Raise the heat to medium and cook stirring constantly for about 30 seconds. Add spiced rum and simmer for 45 seconds; stir in the cashew Juice and brown sugar. Increase the heat to high and let cook till bubbling. Stir for 10 seconds more and then shut off the fire and let cool. Now that you've seen the final product I'd like to just say that the cashew & ginger rum sauce would also be very good on pork chops too. I've never tried it, but I probably will pretty soon. If you are going to be in Belize and wondering what to do this weekend you might want to try some really good Belizean cashew concoctions and food wonders. Then head on down or up to Crooked Tree Village (about 30 mins heading north on the Northern Highway) Belize. On Saturday and Sunday this weekend Crooked Tree will be hosting the Cashew Festival which could be a fantastic time. Go out and experience this wonderful festival, take the family, take the kids. And most of all Enjoy yourself and your food.